-=- Full "Retro Mortis" Series Article Index -=- Retro Mortis - RTS (Part 1) - It was found in a Desert... Retro Mortis - RTS (Part 2) - Then a Blizzard came... Retro Mortis - RTS (Part 3) - Forged in Steel... Retro Mortis - RTS (Part 4) - A New Hope? It would be advisable to have read part 1 and 2 (above) before proceeding. Greetings, Disclaimer: When I started Part 3, I was hoping to tie the knot with RTS right here, but I already knew there would be too much to add and that a Part 4 would be required. Instead of cutting corners, I've decided to stick with the highlights and leave "everything else" for future parts. Sorry if you thought you'd be done with me by now! There are many ways to classify RTS history. For the sake of this article, we'll assume that by "second age", we refer to games that were released several months after Warcraft: Orcs and Humans. These were developed with sufficient observation of the multiplayer interactions that were first showcased in Warcraft, and come with a (perhaps naive) understanding of how multiplayer has affected the RTS as a genre. In many ways, changing the focus of the RTS genre from that of a conventional single player experience to a competitive e-sport started when players had a chance to play games against one another, and how game developers reflected upon this experience. It shaped and defined new visions and new objectives for the developers, and was the underlying metric against which most decisions to come would be matched. We've already observed that Dune II: The Building of a Dynasty was quite a strong precursor that spawned an entire genre, and it was so meaty there was little a single player game could hope to further achieve. Warcraft: Orcs and Humans was built as both a testament to Dune II (revered by all of the development team if Patrick Wyatt is to be believed) and as an attempt to stretch the possibilites of this game to the multiplayer scene, without fore-knowledge of just how much untapped potential there was along that thread. Building upon the Multiplayer experience and shifting production focus made sense: On the one hand, there didn't seem to be that much that could be added/changed to the then-winning formula of the RTS, and multiplayer had already proved it could garner its own share of the sales pot as a retail box feature. It wasn't a lack of inspiration, but an actual opportunity that helped crystallize the RTS as it was. Developers did not seek to be inventive in how the RTS mechanics worked because there was simply too much work to be done to fully bring multiplayer to the next step: making it a sport (or Chess 2.0).
" By all accounts, Command & Conquer (C&C) was an immediate and unmitigated success when it was released in late 1995. It spawned one of the most lucrative series in videogame history, and its title has become synonymous with real-time strategy (RTS). Yet, the basis of the game was not original. Dune II, from the same developer, had previously established the RTS genre, and C&C was almost identical in many respects. What made C&C such a sensation was its refinement of Dune II's gameplay ideas with the addition of several key innovations, which set the standard for all games of the genre to come. Internet play and varied styles of play between the different armies in the game were some of the important advances that are now fundamental to RTS. Furthermore, C&C's flaws clearly showed some areas in which improvement was possible." With people setting up for multiplayer sessions, it soon became apparent that Warcraft: Orcs and Humans took too much time off people's phone lines. Blizzard felt they had a chance to increase popularity of the genre by making the game faster (allowing more players to play, and more games to actually be completed). As a result, they've made the game faster in many ways, most notably through unit movement (which had both an effect on economy and combat). The expected outcome was to make games shorter and insure people could play more often, but there were also a few byproducts that were introduced by this new "pacing": Because the game was faster, player mastery over the input became critical once more. The game slowly shifted away from a tactical game (such as Warcraft: Orcs and Humans) and entered the realm of the dreaded APM (Actions per minute). Here, the problem was not necessarily UX (such as in Dune II), as the game effectively provided tools developed during Warcraft: Orcs and Humans (multi-selection, command hotkeys, control groups), but the effect was similar: an average player would feel there was too much to do and would need to prioritize the most meaningful micro-management-intensive actions at any given time. Another byproduct of the increased pacing were the strategic implications that came along. Since units still took a fair bit of time to be created, but units moved faster, it meant that the ratio of time to create a unit vs moving it somewhere on the map increased. In essence, it diminished the defender's advantage significantly: units would take the same time to be created, but it wouldn't take as long as before to bring these units as reinforcements, insuring the defender wouldn't benefit as much from having a "higher unit count" when defending his base. As the defender's advantage was diminished, turtling became much less potent, and the game really became about projecting one's force across the map and control it as early as possible (both to see enemy incursions before they occured, and to control resources). These considerable changes to pacing, though they may not appear to be much, are one of the key elements that would stick in future installments and one of the last cornerstones of a "Blizzard-style RTS". All future Blizzard RTS followed in Warcraft II's wake (Starcraft I & II, Warcraft III) along with several other competitive RTS. In Warcraft 2, time is streamlined. Actions are meant to be fast-paced, putting more emphasis on player execution than strategy. It puts the player under rush and leads the player with the most nerves to victory. Units are more expandable, and the unit cap has been raised, shifting focus to constant streams of military production. Economic upgrades also reduce the need for peasants by a bit, further focusing on military production. To accomodate this slight shift, the multi-selection tool is extended to 9 units to improve maneuverability, and single-click actions (right clicking) allows for quick orders. The concept of Roads is removed from the game altogether, removing building placement restrictions. With the inclusion of watch-towers, which are defensive buildings, it is now possible to guard any specific position on the map with extra support. Even offensively when needed. To support "free-building", it is now possible to erect town halls and some proxy-buildings that allow resource gathering, reducing/annihilating the need for supply lines at a very cheap price. Concentration of forces becomes more prevalent as a result. Although most of these changes appear simple, they change the game's nature: Where Warcraft: Orcs and Humans was all about trying to protect long supply lines of peasants cutting distant forests or fetching gold from remote gold mines, the game now starts to look more like "expansions" (small bases) with economical or military focus. It teaches the player that this is the way to play the game now, and it looks nothing like the previous game. Yet, there are a few innovations in Warcraft II. One of the most important is the Shroud. Up to this point, most games dealing with "fog of war" only gave the impression of the unknown. The map was covered in darkness, but as soon as a unit revealed a portion of the map, it would remain visible forever. The original fog of war was more about discovering the "landscape" and much less so keeping tabs on enemy movement. The Shroud, or fog of war 2.0, actually regrows when there are no units with line of sight to a portion of the map. The landscape itself remains, as this is fairly static, but the knowledge of enemy troops and buildings becomes vague: units are no longer shown, and buildings only reveal the last known status of a given area (disregarding any changes that may have been operated later). This is an ideal inclusion for a multiplayer game as it forces players to spread their forces to have the information they need. They are likely to spy on their enemies to know what's coming their way, and it makes it that much better. It is such a good system in fact that it will remain largely unchanged until Starcraft II: Wings of Liberty (but more on that later). Since the dawn of time... well not really, but since Warcraft: Orcs and Humans, the idea of more resources had been considered. Dune II had only 1: spice melange. Warcraft: Orcs and Humans had 2, but actually had 3 during development (the third one being rocks I believe). 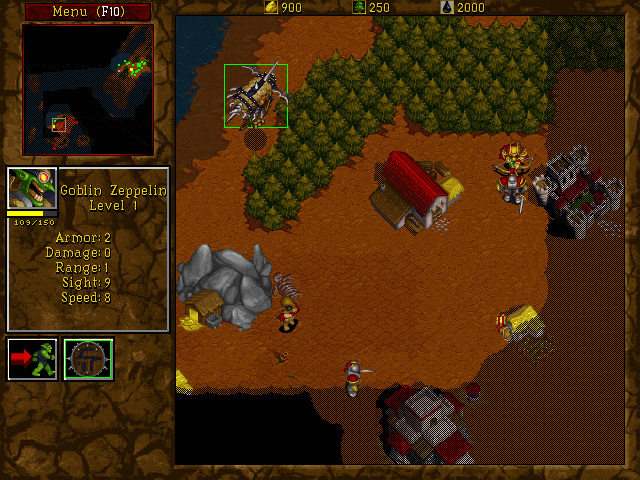 The development team behind Warcraft II chose to move forward with the idea of a third resource, one that would unlock another facet of the game. Their choice was to have an "advanced" resource only available in the mid to late-game that would provide access to more advanced units (naval) and unit upgrades (some of which affect non-naval units). 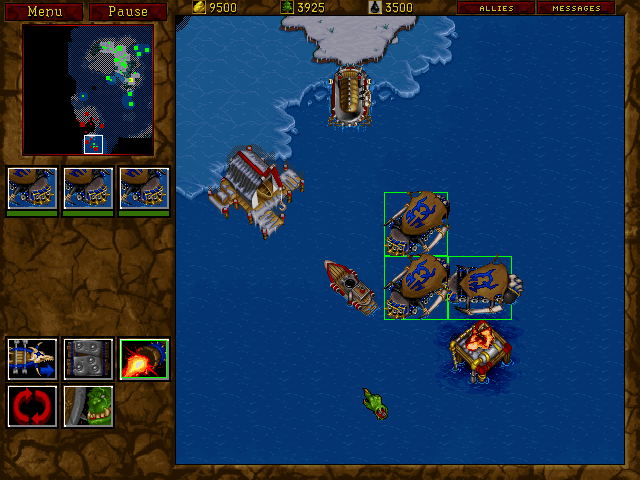 Unlike Age of Empires, in order to erect a fleet, a player would need to have control over water before being able to claim their right to it, and tentatively, the first player to dominate the seas could deny access to his opponent and perform interdiction missions to raid its borders. The only means to escape this would be to utilize air units. This was a tricky move given that oil was not necessarily employed to build more powerful units, but rather, to unlock a different layer of the terrain which was, in several maps, optional. This rendered oil somewhat superfluous. Its legacy however, is that it inspired the concept of a resource that would only become available with some form of investment, and would be helpful for more advance units. Though this can arguably said of lumbers (used to build archers) there was no real form of investment, and it was already necessary for building construction. This concept would later become used in other games such as Starcraft (Vespene Gas). Air units really made their debut in Warcraft II. They allowed to trade high amounts of resources to take advantage of free-movement. This allowed both access to very efficient scouting units (Zeppelins) and all-terrain capable strike units (dragons, gryphons). The air units also helped counter-balance the naval units' economic issue (can't build some if you can't control the sea first), but they also allowed to bypass terrain collisions and strike from unexpected angles, fast, and relatively unscathed when desired. This greatly diminished the value of ground units (though they were still stronger on average in 1v1 encounters) and improved the value of mixed arms tactics. Air units have since been included in many RTS games (specifically those that value mixed arms tactics over maneuverability). One of the key elements bundled along with Warcraft II was the Level Editor: a simple yet very efficient means to create additionnal levels for the game (playable in multiplayer) which would make the game last much longer. In a Blizzard-style RTS, the level-editor became de-facto (Starctaft, Warcraft III and Starcraft II replicated this) often leading to very popular maps that would evolve into spinoff games/genres (DOTA/LOL or the MOBA genre is often said to be born from a Warcraft III mod). A small case can be made about "food cost". Though each faction deals with it differently, the system itself actually changed across the board. Unlike previous installments, each unit has a unique food cost. A Zealot, for example, is worth 2 food, whereas a Marine is worth only 1, and Zerglings are worth 0.5. Though this may appear as a small change, it changes the game by a wide margin. The problem with earlier titles is that it was actually preferable to save on resources and max the food count with higher tier units (just ogres or knights in Warcraft II, for example, was strictly better than just grunts or footmen). An adjusted food count changes that by making each unit worth exactly what it should be, and this encourages players not to hold back: when a player fields a 200 food count army he is a formidable opponent, regardless of what tier they are in. And just because his opponent can field 150 food with strictly superior units doesn't mean he has any chance to win the encounter. The main advantage of this system is that lower-tier units remain relevant throughout the game match, and the encounter feels less like a tech-race to the best unit and more like a game of blitz rock-paper-scissor. Players need to open up their options and retain an ability to shift production focus at a moment's notice to better counter their enemies. Siege tanks, for example, are a formidable threat against ground units and can be fielded in numbers to secure a win, but they still need the support of marines to prevent zergling swarms from rushing in, or air units from dispatching them. No unit thrumps it all. Starcraft has a "Tiered Logic" where there are logical steps to take in order to progress along any axis of the tech tree. One of its key tools is the inclusion of a tiered resource: The Vespene Geyser (Vespere Gas). Unlike previous installements that included secondary resources such as "Wood", the Vespene Geysers require a hefty investment in resource and time to unlock (Refinery) and have a much more limited income (maxed output with 3 worker units) capacity. The ramifications of these limitations are numerous, but at its core, it permits (and dictates) the concept of a Tiered Logic. Units that require only minerals to build (and are built from buildings that require only minerals) then obviously become the most readily available (tier 1) and any unit that requires a single building investent of Gas or has a limited Gas cost itself becomes a slightly more important investment (tier 2). Likewise, further investments of Gas (either through multiple buildings, or higher gas cost) relegate units to further tiers along the tree. These tiers are a balancing tool that players can learn to rely on: they know, for a fact, that unit X cannot appear before Y units of time into the game, simply because of the logical steps that need to be taken towards getting the necessary gas investment to get there. Furthermore, it ensures that player can strategize and optimize their resource collection to take advantage of this: a well-prepared player can shift to tier 2 units much more efficiently than a rookie, and can oftentimes claim a decisive advantage for doing so at the right time. Knowing "when" to build a refinery, and how many to build becomes key to mastering that tiered logic. 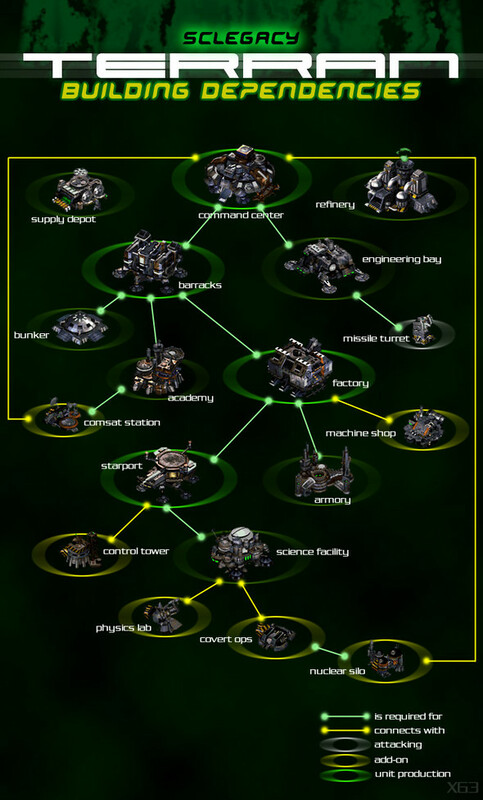 The elaborate tech tree of each faction creates a large number of permutations and an acute observer may be able to tell a player's strategy just by the timing of refineries being built, or the amount of units shifting from minerals to gas. While previous installments sometimes had forced tiers (upgrading the townhall in Warcraft II for example) the tiered logic approach is much more organic and opens up more possibilities. Coupled with actual unit food, this gives players several opportunities and freedom of choice on whether to evolve at all or use of the lower-tier tactics (bio-ball for example). 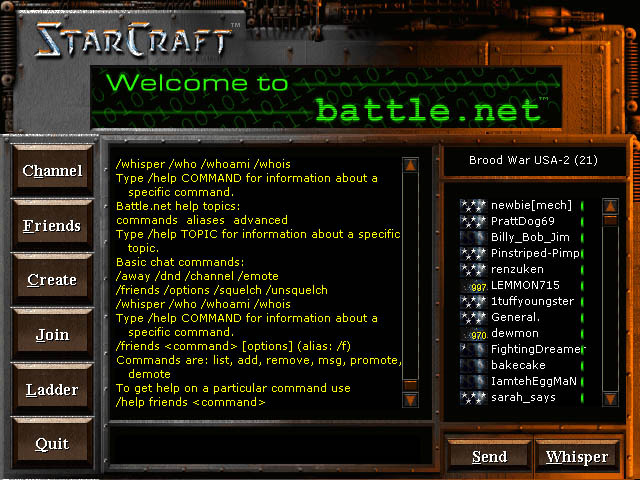 Starcraft, unlike its predecessors, was released through Battle.net, Blizzard's online gaming platform. It allowed several multiplayer "metagame" features such as ladders (which would keep scores of win/losses/draws for individual players). It was also a very efficient platform to match-up 8 players together and provided a number of game modes (including custom scenario). From simply joining up with a friend through dialup, players could now jump into the fray and faceoff with up to 7 random strangers (or friends) from the internet without having to wait. There was always someone online to play against and playing Starcraft no longer required tuning one's agenda with friends'. This contributed to the then rising phenomenon of playing against or with strangers. This also confronted more players to the "online norm" as far as playing skill was concerned, instead of focusing on small pockets of players that would play locally against one another. In essence, this contributed to strategies emerging at an alarming rate, then shifting what many would refer to as the "metagame" (strategies that tend to be dominant solely because certain strategies are in vogue amongst the large populace). 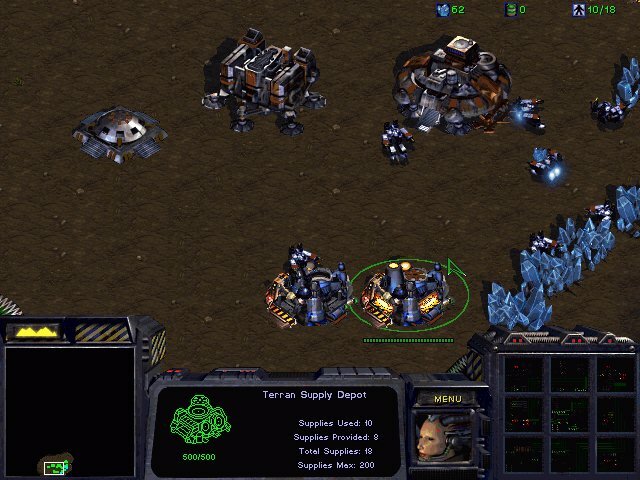 For example, building a supply depot close by a ramp to limit access was not necessarily considered a "good move" by gameplay mechanics' standards, but after a lot of players followed the 4, 5 or 6 pool rush tactics, it became an invaluable means of breaking early zerging rushes. Likewise, dark templars are a very circumstancial unit, but they became much more potent against volley of protoss players that would play "4 Gate Goon". Devoid of the metagame that came along with Battle.net's existence, all of these are doubtful approaches, but in the context of a globalized gaming hub, players were much more likely to face similar strategies reccurently and devise plans to defeat them rather than optimize their "general" strategy. There's an undeniable portion of "new" in Stacraft. The unique brand, assymetrical design and tiered logic prove this. But Starcraft shines mostly by its brilliant balance. Coming along assymetrical design came the arduous task of unit balancing: How could matches be kept "balanced" all the while offering drastically different options? Never before had an RTS put so much emphasis on its Patches. Frequently, patches would be released to counter emerging strategies in the metagame, and insure that skillful play was always encouraged. But the core release itself was already quite a piece of work. The player community helped shape this balance, always seeking ways to break it (reverse-engineering the exact calculations behind the game). In the end, though Starcraft remains imperfect, it is very close to an evenly matched game, and player input has so much power on that balance that it is almost impossible to abuse dominant strategies: there's a counter to everything, you just need to have sufficient experience to know what it is. As a result, Starcraft is another shining example of execution. I would even argue that its popularity stemmed from the mere fact it was closer to chess than any other RTS before its time (although, arguably, an asymmetric version of chess such as Tafl). Unlike most predecessors, Starcraft handles damage in a very deterministic way, making each outcome known, and limiting hidden information to the fog of war / shroud. This minimizes the amount of gambling and emphasizes the value of min/maxing. One needs only venture at TeamLiquid to notice how much thought has been put towards trying to find the best counter to everything. Determining when to get these precious weapon upgrades, for example, can be quantified almost easily! The following years would bring us many quality games, and exciting experiences. For the most part, however, it is hard to determine what trully distinguishes Starcraft I from Starcraft II, Dune 2000 from Emperor Dune, or even Ages of Empire from most of the aforementionned games. Though the branding, visual quality and feel of these games would feel drastically different, they would remain mechanically the same. It is true that Stacraft 2 introduced Xel'naga towers, removed fog of war (in multiplayer only: keeping only the "shroud" as most pro players knew the maps by heart anyway) but overall, it is still the same game. It is true that Emperor Dune introduced new units, making each faction more asymmetrical, but it was still Dune 2(000) at its core. Even Age of Empires II did not bring much to the table despite being one of the most well-executed games in the genre. It had more resources, which, much like Vespene Gas, affected how players would go about securing them. Though game balancing kept evolving, the mold of what an RTS was supposed to be appeared to be crystallized in such a way that very few risked venturing away from the conventions. To a degree, the genre became stale. -The Second Age of RTS is still present to this day. Successful titles such as Starcraft II are nothing more than well-executed "second age" RTS games, but they do it well. As their tech tree would allow, they've chosen to remain at a lower "tier" but came up with fierce strategies to dominate, and are alive to this day simply because they keep getting better. An acute observer might rightfully point out that I'm - intentionally - leaving several poignant examples aside. Up to this point, I've assumed that all development studios have focused exclusively on the "race for multiplayer", never attempting to introduce different core mechanics to the game. This couldn't be further from the truth, but it helped me separate these games that do fit the mold from the "others", which I'll discuss in Part 4. If you're into that sort of thing... stay tuned! 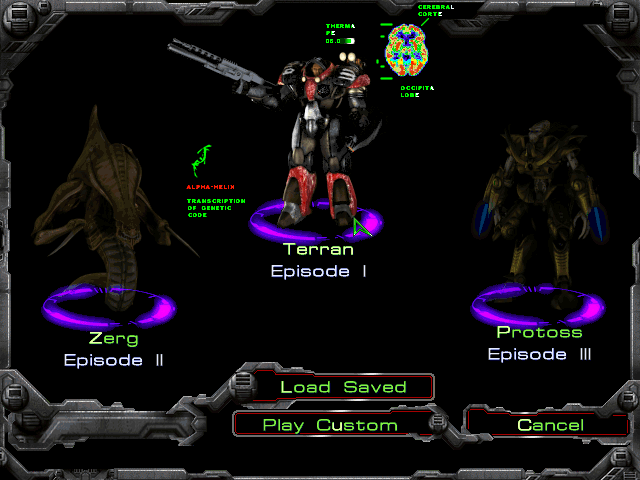 i see you never played Dark Reign from 1997... wich outshines starcraft or TA in so many aspects of multiplayer and AI. I actually did play Dark Reign, although perhaps a bit post-release. An acute observer might rightfully point out that I'm - intentionally - leaving several poignant examples aside. Up to this point, I've assumed that all development studios have focused exclusively on the "race for multiplayer", never attempting to introduce different core mechanics to the game. This couldn't be further from the truth, but it helped me separate these games that do fit the mold from the "others", which I'll discuss in Part 4. If you're into that sort of thing... stay tuned! The truth is I can't mention every game, no matter how good it might be. There's an underlying structure to this article series that (I hope) keeps it coherent without glossing over too many critical releases. If time permits, I've already considered making a 'lost chapters' article at the end that would include more of a timeline and less babbling. Looking forward to part IV. I hope the Kohan games make an appearance at some time. KIS/KAG introduced a lot of new RTS elements that were later incorporated into other series. Oh yes, it will. Kohan's approach to military "unit" and formation was great. Supply lines were also something that fringed with tactical wargames. There's certainly a lot to be said of the Kohan series! It is true that Stacraft 2... removed fog of war (keeping only the "shroud" as most pro players knew the maps by heart anyway) but overall, it is still the same game. Er, not quite. Fog of war in Starcraft II retains its original behaviour in the campaign - it's only in multiplayer that maps are revealed but fogged. That is accurate. Though, given the premice that these games were on a race for the multiplayer scene (and that SCII's campaign is mostly an afterthought to the competitive multiplayer experience), it's not so much a fluke. That being said, well worth mentionning, and I'll fix this right away! Cool article, nice work. I was thinking about what my favorite RTS games and how they stand up. I still load up Dune 2, C&C and StarCraft every once and a while but I think that's mostly for nostalgic reasons. The only ones I still truly enjoy without the loving haze of nostalgia are Supreme Commander and Dungeon Keeper. Total Annihilation/Supreme Commander were already covered a bit but I think Dungeon Keeper deserves a mention. There's no other RTS really like it and I think that's why people sometimes forget that it is actually an RTS. There is still base building, resource gathering, and unit management but beyond that it really breaks the mold that Dune 2 made. At the core, Dune 2 and Starcraft are really the same game. There are obviously tons of improvements and refinements but the core game play remains the same. Dungeon Keeper really did something unique and vastly different in terms of the game play while still fitting into that RTS genre. You're not wrong. Dungeon Keeper is different, but it is also what I call an Hybrid. Part IV will seek to cover those (how RTS have managed to break the mold, at the cost of diluting the genre a bit). In many ways, you could say the same thing happened to RPGs, a lot far back. I'll try to include it in Part IV, but bear in mind, the list of games I'm to discuss these is already quite impressive. Unlike previous articles where I'm dissecting 1-2 games, I'll be glossing over many picking up on the highlights, so you might be disappointed if I only mention it, but I'll be sure to! Is Age of Empires II on the list? Only briefly mentioned (twice) in this article. Since the purpose of this article is to demonstrate historical progress (and not make a tribute to great games, as this would be mostly a popularity contest which would be counter-productive) I have not seen the point in making a full article about AoE. It is undoubtedly a great game, also a personal favorite, but it contributes little to the discussion at hand I'm afraid. I think the most innovative thing in AoE was the engine. Instead of using pre-rendered animations everything was handled by the game's physics engine which I don't believe had been done before in an RTS. Also the scope of the game, going through ages of a civilization was pretty different than what had been done before. Overall it felt like variations on a theme, but it was still one of the best RTS games of it's time for sure. Almost didn't recognize the SC1 menu pages. After your done recapping history, be interested ti hear why you think the genre is so hard to innovate in? Ya, sure, RTS is a high investment, and messing with that formula is risky, but still woth considering. Also, you might like to know, if you don't already, Former Westwood Devs have said one thing they realize on retrospect they should have done, is create the online framework Battle net turned out to be for their games, they had the talent and the resources back then, but they-for whatever reason didn't go there. The interesting thing I find with game design now, is we have the talent and resources to really experiment with mechanics, especially with digital feed back and patching, it's a shame we don't see more shake ups. Don't worry folks, Part 4 will come (with yet another joke in the title for sure). I've been swamped with other stuff, but made some progress on it no later than today. It will be a drastically different article format though, so bear that in mind. It's out now! (see header of article for link).